During the twenty years it took me to convert from a Bob Jones University student to a Catholic I considered many of the Marian dogmas to be pious opinions. It was okay for Catholics to believe them, but why did they have to go and make them dogmas and therefore make it more difficult for me to join their church? Then I came to realize that unless you have a full and complete understanding of Mary –which all the dogmas expressed–then you had a defective understanding of Jesus Christ the Redeemer and the complete extent of his saving work. The Assumption of the Blessed Virgin being the final dogma, here are ten things to remember to fulfill our understanding not only of Mary, but of Jesus her Son. 1. Mary and Jesus share an intimate bond – Mary is unique. No other creature was united with a person of the Godhead as was Mary. Jesus took Mary’s genetic material. He was born of her flesh. This means Jesus looked like Mary. Think about it. No saint, no angel, no one else was so close to God as Mary. God the Son took residence in her womb, shared her bloodstream, nursed at her breast, gazed at her face, loved her and was loved by her in a bond so close that it can only be understood by every mother and every mother’s son. thou the ever blessed, and most pure, and the Mother of our God. thou the true Theotokos, we magnify thee. This is why the church teaches that the dogma of the Assumption is “fitting and right” Because she is higher than the angels it is right that she should have been assumed body and soul into heaven by a wonderful miracle of God. 3. 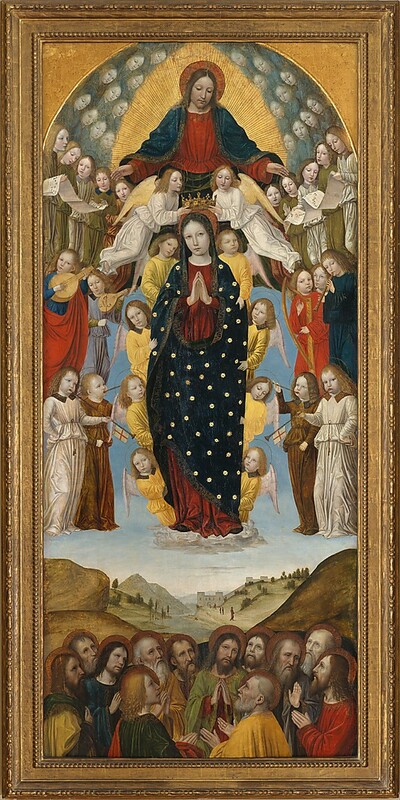 Mary’s Assumption is n0t Separate from her Coronation – The Blessed Virgin is crowned as Queen of Heaven also because she is higher than any other created being. The glory she is given is the reflected glory of her son. As the moon reflects the sun, so Mary the Queen of Heaven reflects the glory of her Son. Her coronation is the crowning glory of she who is the crown and glory of heaven. 4. Her Ascension is foretold in the procession of the Ark of the Covenant into Jerusalem – In 1 Chronicles 15 the Ark of the Covenant is carried by the priests in procession into the holy city of Jerusalem. So Mary is the Ark of the Covenant between God and Man. The ark in the OT contained the manna and the tablets of the law. So Mary contains the Bread of Heaven and the Fulfillment of the Law. As Jerusalem is the earthly symbol of the heavenly city, so as the Ark of the Covenant is carried up so Mary is carried up into heaven.